Minnesotans know a thing or two about winter weather—because we generally get a whole lot of it. Whether you embrace the snowy paradise the state transforms into, or you’d rather snuggle up indoors, Minnesota has something for everyone to choose from. In the “State of Hockey,” you’ll be sure to find a magnifcant outdoor rink nearby to lace up your skates. If it’s a little too cold out though, enjoy a trip to the zoo or the mall. Take your pick. One of, if not the, premier winter events in Minnesota is the St. Paul Winter Carnival. One of the largest events of its type in the U.S., the Winter Carnival has been around since the 1800s and held annually for the last several decades. With everything from fun runs, parades and a Metro-wide scavenger hunt, the event has plenty of family-friendly activities to take your mind off winter for a few days. Whether you’re an indoor person or an outdoor person during winter, the Minnesota Zoo has something for you. All of the zoo’s outdoor exhibits consist of animals that come from climates similar to those of Minnesota, from Amur tigers to snow leopards and timber wolves, the zoo in winter is pretty amazing. Meanwhile, more cold-averse folks will enjoy the colorful aquarium exhibits and the humidity of the indoor tropical trail. It sure takes the edge off a 10-below day. Some folks like to go ice fishing, others prefer shopping and amusement park rides. The one Minnesota spot where you can max out your credit cards and then shake it off on a roller coaster is the Mall of America. One of the world’s largest malls, the MOA has plenty of other indoor activities, as well, ranging from movie theaters and a comedy club to a ropes course and a walk-through aquarium. You may never have to go outside again. A large-scale art installation/colony inspired by Minnesota’s ice fishing cultures, the Art Shanty Projects set up clusters of ice-house-style, artist-designed, interactive shanties on a Twin Cities lake each year. The shanties are open to the public on weekends for a few weeks and bring a dose of whimsy to the long, dark winters. Inside folks will have to endure a little walking between shanties, but most of them are kept warm with personality and propane. Another indoor oasis for winter-resisters, the Como Park Conservatory is a series of indoor gardens, punctuated with fountains and tickled with sunlight. The occasional cellist or string quartet adds a sublime soundtrack, while a constant temperature in the 80s soothes winter-weary skin and souls. Ice fishing is one of the state’s most popular winter activities, and no where is it such a big deal as it is on Lake Mille Lacs. The lake’s size and relative shallowness make it a perfect lake for winter fishing. Once the state’s top walleye fishery, levels have dropped to a point where walleye catches are restricted. But there are plenty of other species to target from the warmth of your ice house. An annual event in Duluth’s Bayfront Festival Park, Bentleyville Tour of Lights is the largest, free walk-through lighting display in the U.S. More than four million lights deck the 20-acre, lakefront park during the holiday season. Visitors can enjoy complimentary snacks and cocoa as they stroll among the lights, visit Rudolph the Red Nosed Reindeer and Santa, or warm themselves beside one of the festival’s fire pits. For the uninitiated, a yurt is a relatively-permanent, tent-like dwelling that has its roots in Mongolian culture—and yurts have become kind of a big deal in Northern Minnesota, particularly around Boundary Waters Canoe Area Wilderness (BWCAW). Whether you want to bring your own gear and hunker down in an unadorned model, glamp in a yurt stocked with luxury amenities, or ski/snowshoe from one to another, yurt camping is a great way enjoy winter in the far north. Some of the best mushers in the state live in and around Ely. 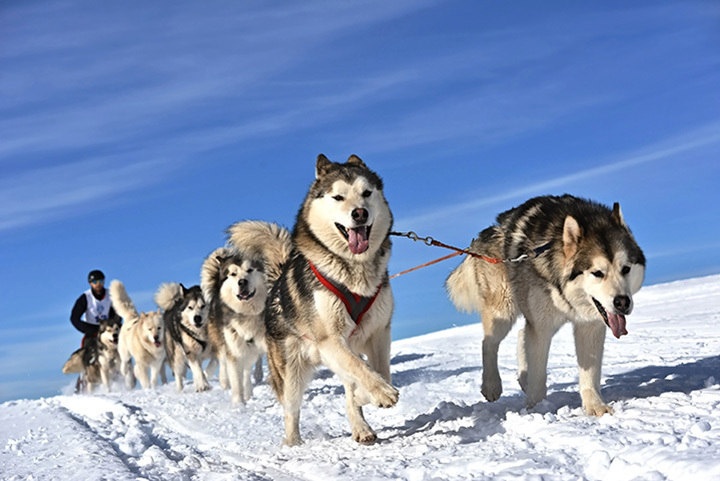 So, that’s where you need to go for a quintessential Minnesota dogsled experience. Deep, hemlock forests, large frozen lakes and miles upon miles of trails make the area an ideal locale for dogsledding. Most operators will let you try your hand at mushing, if you’re up for it, or you can also just hunker down under a blanket and enjoy the ride. A long-standing Minnesota tradition, seeing A Christmas Carol at the Guthrie Theater—Minnesota’s best-known and most-respected playhouse—has been a rite of holiday passage for generations. The Guthrie does a slightly different take on the Dickens classic, so every year, there’s something new to see. This is one of the reasons that families return season after season. As a Midwestern state, Minnesota is vertically-challenged in most places. Although ski runs can be found along the deep river valleys near the Twin Cities, the state’s best downhill slopes are on the North Shore of Lake Superior. Lutsen Resort, in the small Sawbill Mountain range, is Minnesota’s biggest ski destination and boasts the longest runs in the state. In Minnesota, the self-anointed “State of Hockey” and home to the Hockey Hall of Fame (Eveleth), no winter would be complete without taking in a hockey game—or several. The Minnesota Wild, the state’s NHL franchise, play in downtown St. Paul. However, many of the state’s universities, including the Twin Cities and Duluth campuses of the University of Minnesota, have nationally-competitive programs, year-in and year-out. The state high school tournament sells out a major arena for three days every March. The National Pond Hockey Championships, regularly held in Minneapolis, offer a chance to see competitive hockey in an outdoor setting. But, to see a true sports dynasty at work, grab tickets to a Gopher Women’s Hockey game. The U of MN program has won several national championships in the last few years, and continues to offer one of the state’s best shows on ice. As you can imagine, in the Land of 10,000 Lakes, there are plenty of places to ice skate. Few are prettier and almost none are as iconic as Lake of the Isles in Minneapolis. The lake is located in the center of one of the city’s most upscale neighborhood’s, but Lake of the Isles, and its green spaces, are a public park. Lights and a warming house make it easy to find a time to skate and enjoy views of gorgeous homes and the lake’s eponymous isles. The Minneapolis Institute of Arts (now simply called and pronounced “Mia”) opens its doors to families one Saturday every month. Not that families aren’t welcome anytime, but on Family Free Saturdays, the state's most venerable art museum hosts interactive activities and hands-on crafts for kids of all ages. With gorgeous views of parks and the Minneapolis skyline, cafes and several levels of masterworks, Mia is not a bad place to hang out on a winter Saturday. Two of the country’s largest cross-country ski events—or “loppets”—take place in Minnesota. Vassaloppet USA is held annually near Mora and participants in the City of Lakes Loppet ski in Minneapolis. Whether you’re a serious competitor, someone who just wants to ski the courses or a spectator, cross country ski lovers will find something to be excited about.